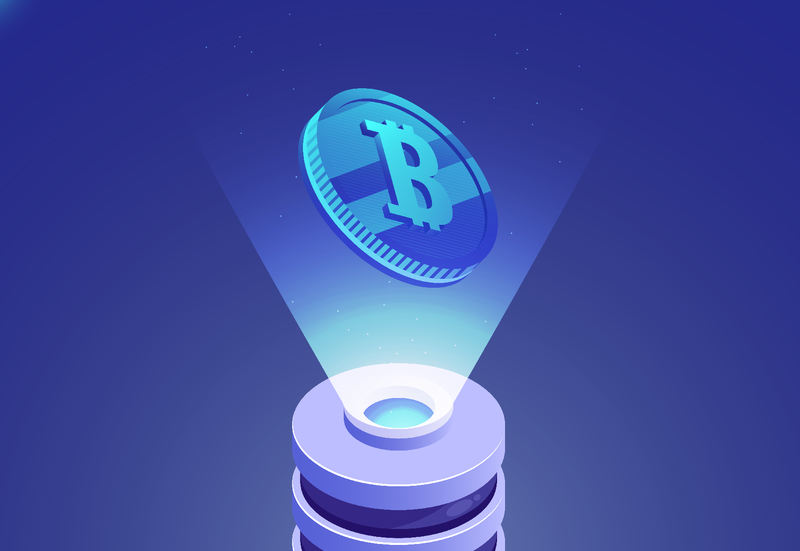 Since the last price analysis that was performed was dedicated toward providing insight into Bitcoin’s long-term prospects, we’re going to go ahead and take a look at its short-term prospects today (October 25th, 2018) and in the next few days as well. Forgive the messy chart above, if you can. But here we can see a mapped out chart that shows all of the resistance and support lines for the price of Bitcoin over the last two weeks. This chart has been shrunken to the 2-hour resolution in order to give a better view of some of the micro-movements on the chart. As noted in one of our earlier price analyses, we thought that the price of Bitcoin was reflecting a symmetrical triangle, but that turned out to not be the case after we started looking at the qualifications of what delineates a symmetrical triangle. If we zoom into the chart a bit, we can get a better sense of where the price action appears to be taking us at the current moment. 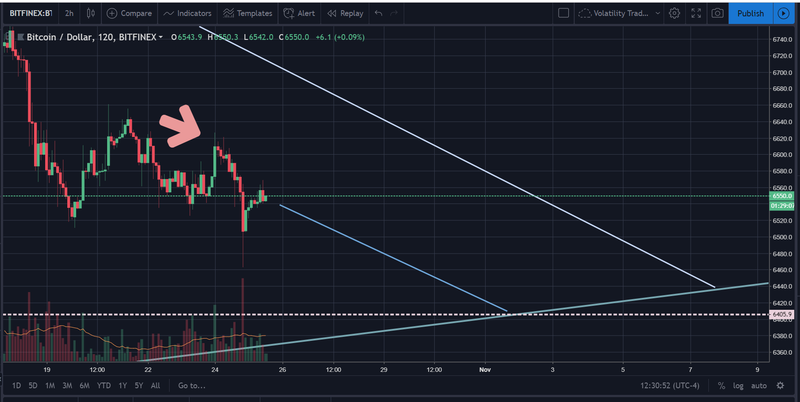 As we can see in the picture above, it appears that the price of Bitcoin bounced against the top trendline and is now headed down for a re-test of the support. But based on the chart below, it appears that the price of Bitcoin is on a trajectory to re-test the lower support around $6,405 approximately. The picture above shows the RSI(14) on the 2-hour chart. As one can see, ever since the spike that occurred on October 15th on the chart, the RSI has been decreasing steadily. Currently, there is no divergence on the chart between the RSI(14) and the price action, so we should be able to take this at face value. Thus, the readings on the RSI(14) confirm our belief that the price will continue to decline (albeit at a very slow rate) until it touches the support unless there is some alternative or exterior news that makes this untrue. Above, is another look at the RSI(14) juxtaposed with the price action of Bitcoin itself to give you all a better understanding of how the RSI(14) is currently matching the price action of Bitcoin, ruling out divergence. This indicator tracks accumulation and distribution periods and plots it on an RSI background. When the line is going up, that means that the buys (buys > sells) is increasing. When the line goes down, that means that the sells (sells > buys) is increasing. When the line is above the purple area, that means that the buy pressure is beyond its normal range and when the line turns red (which will only occur above the purple area), the buy pressure is at an extreme. The same can be said of the sell pressure when the price is below the purple area. 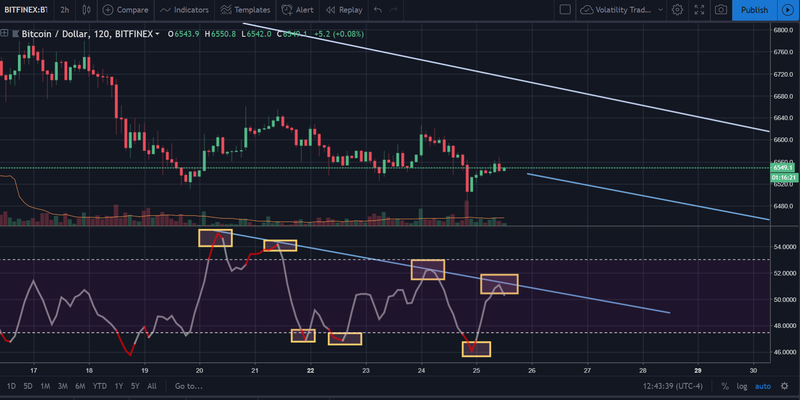 In the picture above, the BoP RSI on the 2-hour chart for Bitcoin is showing us that the distribution or ‘selling’ phase for Bitcoin has been picking up speed over time since approximately the third week of September to this point (about a month later). This also corroborates our belief that the price is headed down to the test the lower support. This indicator is designed to trade like the Donchian Channels whilst also confirming trends when the bottom of the channel turns red (for a confirmed downtrend) or when the bottom of the channel turns green (for a confirmed uptrend). Currently the top of the channel is blue and the bottom of the channel is purple. However, it appears that the price neared the top of the channel recently on the candle before last. When the price reaches the colored part of the indicator, it bounces from there. In that picture that posted above, golden boxes were drawn to show the price ‘bouncing’ each time the price dips into one of the ‘extremes’ on the channel. It’s designed so that this is almost an inevitability. Only on the second to last golden box do you not see this play out (in full), and that usually only occurs when there is an extreme outlier in the data. When evaluating the purpose of this indicator as well as the price data, this also corroborates our suspicions that the price of Bitcoin will be declining as well. All in all, the volatility is so minute on Bitcoin at this present point in time, it probably isn’t worth it to consider any position on the coin in the short-term unless one is leveraging it to the fullest extent. Disclaimer: This is not financial advice and the author does not hold any bitcoins.